Forget login spreadsheets, bookmarks and password managers. Once you added your websites to the dashboard, all are accessible from one place, with a simple click. You can connect all of your websites to a single dashboard, get a summary of what's going on, and log into each of them with just one click. You can add an unlimited number of websites to ManageWP, and all of that for FREE. Just sign up with your email and you are ready to go. A team is helping you, or maybe clients like a hands-on approach. Give them access to your dashboard without revealing your password. Safe Updates automatically create a restore point for you, compare the website before and after the update, and helps you roll back the update if something goes wrong. 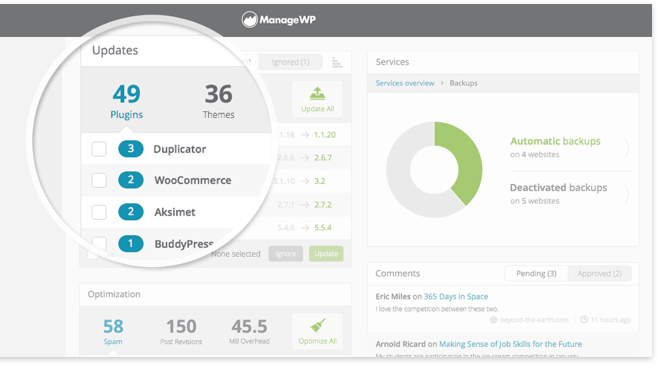 Plugin, theme and WordPress core updates are compiled into a single, intuitive list. Update, ignore, bulk install, deactivate, or install an older version over the current one. Incremental, reliable, comes with off-site storage, and capable of running on an hourly cycle. Everything you need from a great backup. The free backup is ideal for small websites, and websites with static content. 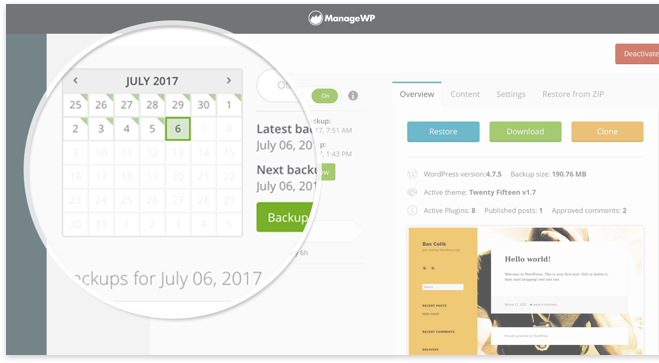 This backup is available to all of our ManageWP users. Our Premium Backup allows you to upload to your own external destination (Dropbox, Google Drive, Amazon S3, OneDrive). Clone your website to a staging area, migrate to a new host, or clone to an existing site. Create your own mix of free and premium add-ons for your websites. Incremental, reliable, comes with off-site storage, and capable of running on an hourly cycle. Keep your clients informed at all times with fully editable, professional Client Reports. 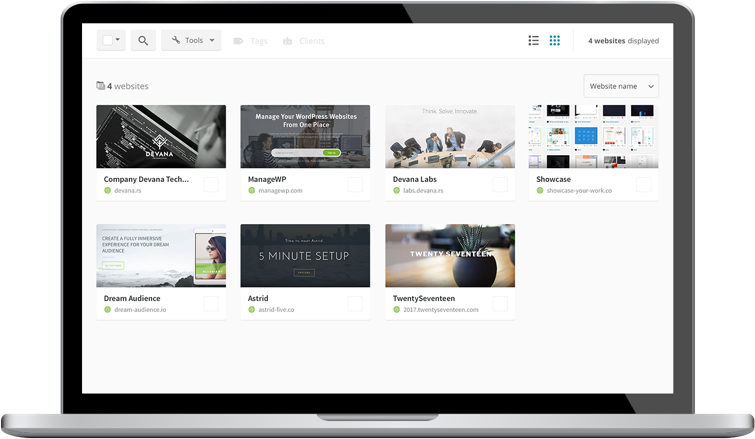 White Label allows you to re-brand our tools and make them your own, or hide them entirely. Maintenance Mode gives you the option of letting your visitors know that you are working on your website, updating or fixing problems. With Code Snippets you can extend the functionality of your site whilst keeping resources required to a minimum. 2-factor authentication prevents any would-be hackers from gaining access to your site through means of brute force attacks. You can connect all of your websites to a single dashboard, get a summary of what’s going on, and log into each of them with just one click. All of your comments in one place, available for you on one screen. This way you can approve or send to spam any comment in seconds. Sync website changes between localhost and live environments with one click. No port forwarding or desktop apps needed. Create your own WordPress website templates using the Template Builder or use an existing backup as a start point for the template creation. Link Monitor is a powerful broken link checker that provides you with regular scans of an entire WordPress site for broken links.